We recognise that people everywhere, in all circumstances of life, age and beliefs live from values at their core, this section is designed to bring you the ‘tools’ to discover and to uncover Values for yourself. How you choose to use them and extend them is your choice, and your imaginative process. The resources in this section allow you to engage activities directly yourself, among your family, friends, and colleagues or even students in the classroom or workplace. Through these activities we discover for ourselves the true meaning of values and the power that Values have to bring positive change into our lives. Enjoy. For assistance contact us - click here to email - or your closest Associate or Focal Point found in the Contact Us section. Please fill in and return to us by email, we will then connect you to your national Associate or Focal Point or you can work direct with us at Living Values Education Distance. This 20 page Guide delivers the techniques and skills required to feel confident to facilitate activities and workshops using Living Values Education these materials with community groups, schools, families etc. The Guide provides professional advice, recommendations as to how to be a successful facilitator, something quite different from a teacher, in that a facilitator draws out while a teacher puts in. 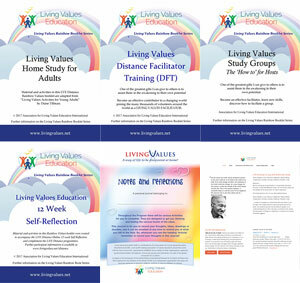 Created specifically for those desiring to share Living Values activities who do not have access to formal values print resources or access to Living Values Education Associates and Trainers. These simple booklets, most with between 48 – 56 pages, can be photocopied for classroom or home use in "booklet" A5 form – ie regular A4 folded (to half size) and stapled. Booklets as in the "Living Values Education Distance Home Study" 52 pages A4 and accompanying "Personal Journal" with more than 97 pages are required to be copied as A4 (full page), on both sides. Each booklet is created with activities for the age or community group and/or the Values information that it features.